Recently the weathermen called for a pretty decent chance of rain, which, fortunately, finally did materialize. Now, if you’re in the Birmingham area and are a homeowner or even just have a small plot to garden, you were well aware, prior to the welcome rain showers of recent days, that it was getting pretty darn dry out there. And, if you, like me, don’t have an irrigation system, that means dragging around hoses. Personally I don’t mind this. Of course, it might be better if I weren’t watering pretty extensively by hand early in the morning at home, when it’s needed, then arriving at Oak Street Garden Shop, my home away from home, and, you guessed it, immediately pulling out the hoses to water the plant inventory on these long, hot late summer days. No, watering by hand keeps me in touch with what’s going on in my personal plant kingdom, and I also really appreciate this quiet time to just be still and think. Moving from plant to plant and back again, trying to water as deeply as possible, (Watering less frequently but deeply should be the goal.) I see things more closely, and make mental notes of things I may need to address. 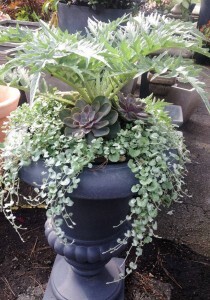 Overwatering kills more plants than underwatering. When roots of a plant are waterlogged and can’t get oxygen, they basically drown, and, even though they’ll look like they need water (wilted leaves), no amount of water will bring them back. Sometimes plants wilt simply because they’re hot and will begin to revive by evening. Plants that have gone past the point of very, very dry when finally watered will have many yellow leaves…a sign of stress. It’s best if you can learn to water before a plant gets so dry. This means getting to know what your individual plants want. But, if you’re not sure, it’s always better to err on the side of more dry than too wet, unless they’re bog plants or those you know want consistently wet soil. As I water, I think back to the drought of 2007. Surprisingly, most of my perennials, shrubs, and trees did indeed survive that awful summer, and I learned a hard lesson on how better to read each one for signs of stress, hose in hand. It was like a personal watering triage each time I pulled the hose out. 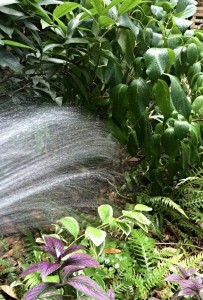 Water the hydrangeas more…those spiraeas will need less…skip over the yuccas, rosemary and sedums… Thankfully, now hand watering is once again a more relaxing endeavor. Irrigation systems do make life easier, for sure. But, when I see them running irresponsibly, either during the hottest portion of the day (So much water is wasted, evaporating into thin air.) or in the midst of rain storms, it worries me. Water is a valuable resource, and we all need to remember to be responsible in our water usage, whether it be inside our homes or out. Install a rain sensor on your system if you haven’t already. The inventory at Oak Street Garden Shop is watered individually, by hand daily, and this has turned out to be quite efficient. We decided to completely dismantle the entire irrigation system a number of years ago, and now we water exactly what needs it. No more groups of plants getting too much water while others parch. I prefer this and feel more like a steward of my plants, both at home and at work. For me, it’s more personal, and I like that. If you have an irrigation system, please use it responsibly. Know how it works and have it checked regularly by a professional irrigation specialist. As your trees and shrubs grow, sprinkler heads often need to be adjusted to continue to water efficiently. Irrigation systems can definitely be wonderful additions in helping maintain your landscape when properly installed and monitored. Take a look HERE for more information. 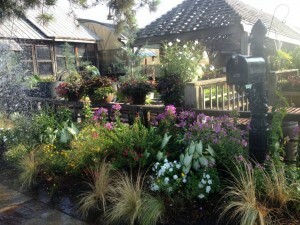 This entry was posted in Watering and tagged watering tips on August 12, 2014 by Kris Blevons.